Jurassic World (2015) is now available for purchasing or renting on iTunes. This tutorial mainly introduces this film and teach you about how to watch or stream iTunes movie Jurassic World on TV for a better visual feast. 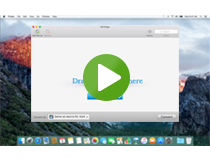 Do you want to stream iTunes HD videos to Vizio LED/LCD/3D/4K/Smart TV for enjoying? Let's remove DRM from iTunes videos with M4VGear thus to transfer iTunes movies/ TV shows to Vizio TV. At CES 2015, Sony introduces 4K LED TV X900C, which draws much attention. The article briefly explores how to play iTunes HD videos on Sony Bravia TV with the help of M4VGear DRM Media Converter. Amazon made Fire TV entered an already crowded market of video-streaming devices. This article talks about the competitiveness of Fire TV and how to stream iTunes videos to Fire TV. "I want to play videos I purchased from itunes store on my Panasonic smart TV but I don't seem to be able to do this." This article tells you how. Owing to Apple FairPlay, iTunes videos are limited from playing on Xbox One, the article heips you convert iTunes videos to Xbox One compatible formats thus to play them freely on Xbox one. The article briefly introduces the features of Roku 3 and Roku Streaming Stick, and makes comparison between them. Meanwhile, the article explores how to play iTunes videos on TV via Roku with the help of M4VGear iTunes to Roku Converter. Have you ever enjoy iTunes HD videos on Samsung Smart TV? This tutorial explores how to stream iTunes DRM protected videos on Samsung Smart TV via Chromecast, which enables viewers to better enjoy the HD videos. Many people have complained that they have purchased iTunes Extras from iTunes only to find that they are not compatible with Apple TV. Are there any solution to watch iTunes Extra on Apple TV?